This easy little project has been perfect for posting drawings, ideas or artwork I make or get from my talented friends both short and tall. I also clip photos, fall leaves, concert tickets, teen idols (Flashback – I did that in high school) or anything else that inspires me. I’m constantly adding and exchanging things I pin up. And sometimes I don’t change anything for several days, weeks or months. 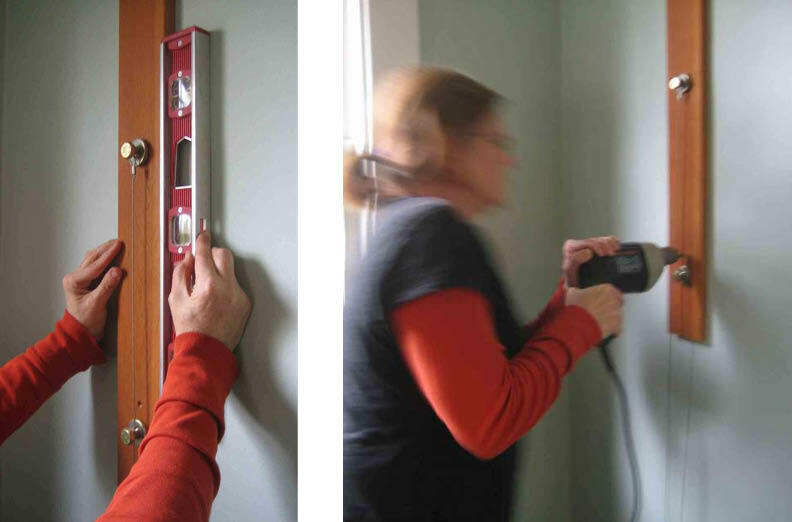 Use a level to insure the boards are vertically square before attaching your boards to the wall. Don’t let the number of steps below scare you off. It really is simple, dimple! Select and prep boards. Sand or leave your boards rough. Stain, paint or leave them as you found them. Use something you already have if you can. Select position for your bolt and washer sets. I used 3 on each board. You can use more or less. Just make sure you choose bold and interesting hardware/bolts and washers! Measure and pre-drill for the bolt hole. Choose a drill bit slightly smaller than your bolts you’ve selected. When you screw in the bolt it will automatically thread the hole. Select positions and pre-drill holes for the screws you’ll use to attach the boards to the wall. At least one on the top and bottom of each board. You can use more if you like. Position and mark where you’d like the boards on the wall. Easiest to find and attach to the studs already in the wall. (I usually go the easy peasy route as the first line of attack.) You can use/Google Molly Bolts if your studs are not in the right positions. Just an extra step, but not difficult. Pre-drill holes into the wall studs. Slightly smaller than your screw size. Use the holes you made in the boards as positioning guides. Attach the boards to the wall beginning with the top screw on each board. The boards will essentially be hanging. You’ll be able to shift the boards left and right after you do this step. Find vertical alignment by using a level along side each board. Mark the position on the wall along side each board. Screw the bottom of each board to the wall. Loop and secure the wires. Slip a Cable Crimping Sleeve onto the end of the wire. Loop it around one of the bolts on the left board. Then crimp/flatten the Sleeve. The loop is now permanent. String the wire over to the opposing bolt on the other board. Loop around that bolt and do the same crimp thing. Continue with each wire. Attach inspiring, beautiful and wonderful things to the lines. You can use clothes pins or any other type of clip you run across. 2 pieces of reclaimed wood. Any length/width and kind of wood you like. Heavy Duty Washers and Bolts. Not for strength, but for aesthetics. Poke around at your local hardware store. There are bound to be some really cool options. 2 Cable Crimp Sleeves for each wire. Sandpaper. Grade depends on how rough the wood and how smooth you want it. I used 150 and 220. We each have or have had at least one of these in our houses at any given time and they all look a little different. The basic idea and steps are the same though. It is really simple dimple. You can do this too! 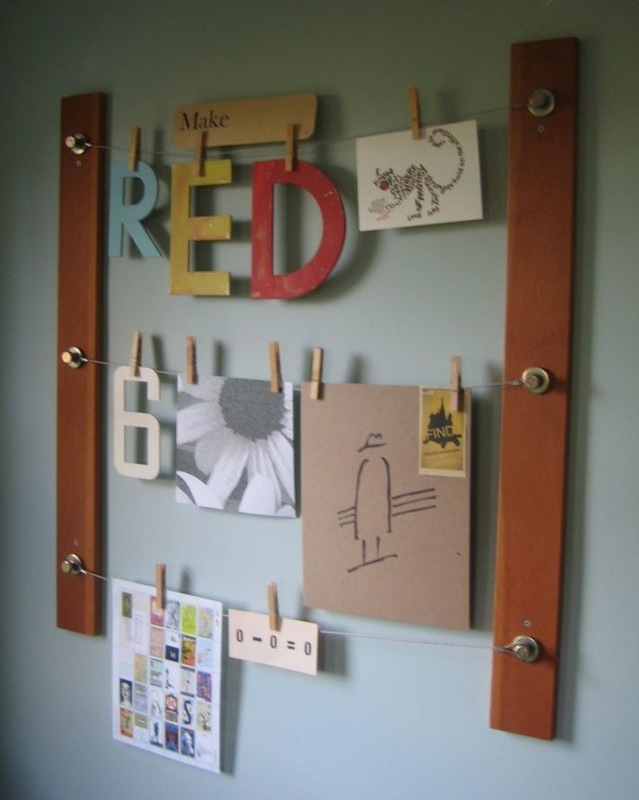 This entry was posted in Everything We've Ever Posted, Our Projects and tagged bulletin board, design, DIY, do it yourself, re-purposed, Reclaimed, Salvage, save money, saving money by Mary Jean. Bookmark the permalink. Cute, cute, cute! you gals always come up with the coolest ideas. Thanks for sharing it in the DIY Talent Parade! 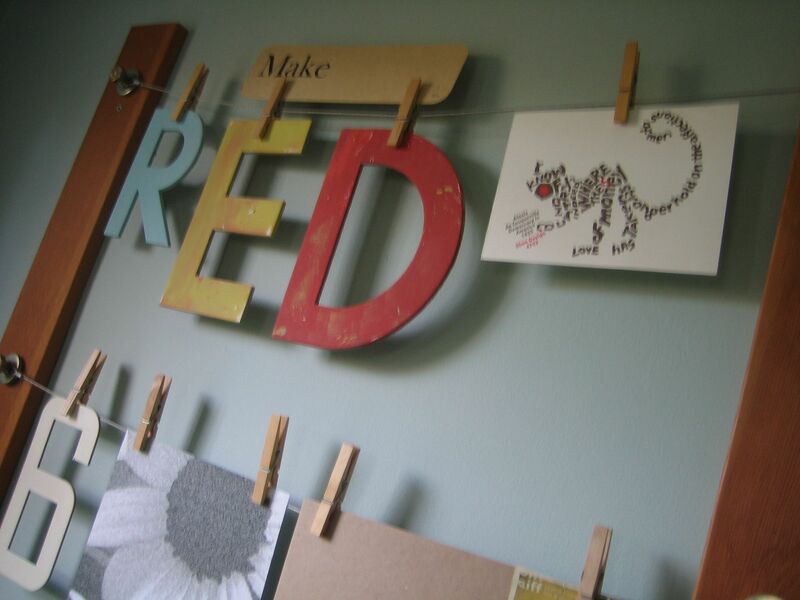 This would be great for displaying kids art as well. We get so much of it and have no real way to give it the respect it deserves.